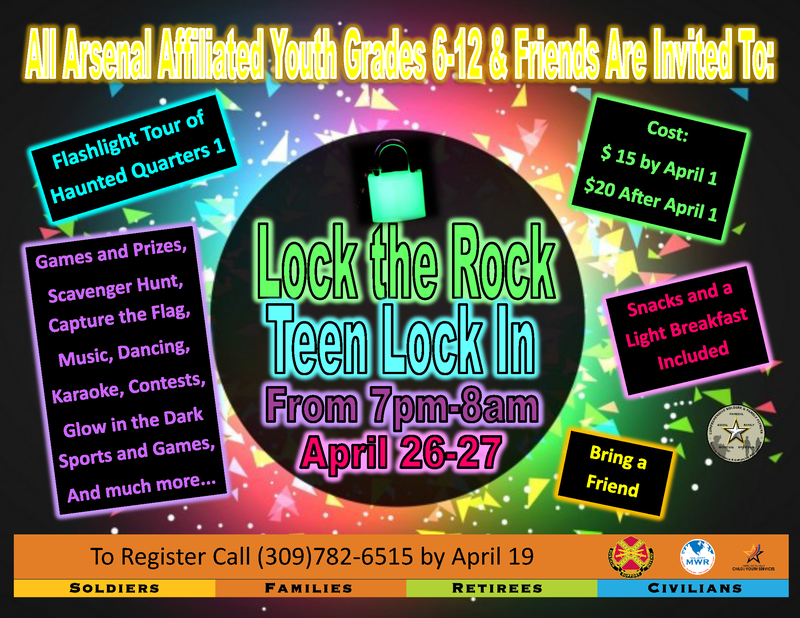 Date: Apr 27 2019, 7 p.m. - Apr 28 2019, 8 a.m.
All Arsenal affiliated youth grades 6-12 and friends are invited to join us for our Lock the Rock Teen Lock-In at the School Age Center. We will be taking a flashlight tour of haunted Quarters One, playing lots of games like scavenger hunts, capture the flag, glow in the dark sports and games, singing karaoke and much more. Cost is $15/teen by Monday, April 1, and $20 after Monday, April 1. Snacks and a light breakfast are included. Bring a friend and join us for what will be an epic night of fun. Please RSVP by calling +1(309) 782-6515 by Friday, April 19.